A nutritious, balanced diet helps keep your hamster happy and healthy for life. 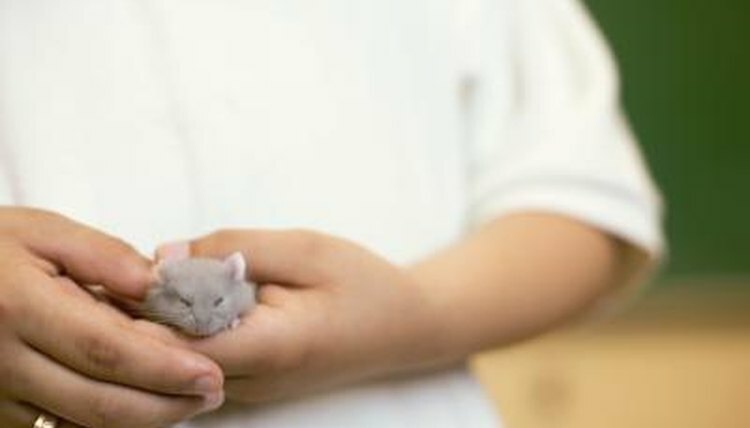 Whether you have a Syrian or dwarf hamster, the calorie and quantity needs are the same; what dwarf hamsters lack in size, they make up for with a faster metabolism. Feed your hamster once daily, either in the early morning or early evening. Always confirm a food's safety before offering fruit, vegetables or other edibles not labeled specifically for hamsters. The foundation of your hamster's diet should be a commercial food mix labeled for hamsters. Choose a product containing a pellets, seeds, grains and cracked corn. Pellets are a standard dietary item for pet rodents, and one of the best. Manufacturers fortify these morsels with most of the nutrients your hamster needs, including protein, fat, vitamins and minerals. Not all hamsters enjoy everything in a particular food mixture. Make sure yours eats the pellets, and not just other ingredients, or she won't get all the nutrients she requires; if she doesn't, try a different brand. Remember, hamsters bury food around their cages, so just because you don't see something in the bowl, it doesn't mean your hamster ate it. Check daily for stashed pellets until you're sure your hamster is eating them. The ASPCA recommends feeding your hamster a small supplemental piece of fresh food once every other day or so. Make it fresh fruit and raw vegetables often. The best choices include those low in sugar and water; sugar isn't good for hamsters, who are prone to diabetes, and excessive water can cause diarrhea. So, even though hamsters can eat figs, grapes, mangoes and bananas, for example, their high sugar content makes them poor choices. Berries, melons, apples, pears, peaches and plums are better options. Avoid watermelon, though, due to its high water content. Hard seeds, pits and stones, like those in apples, grapes, peaches and plums, are dangerous, so make sure your hamster doesn't get them. Some of the best vegetables include leafy greens -- but watch the iceberg lettuce, cabbage and others containing lots of water -- and broccoli, cauliflower, asparagus, celery, carrots, green beans and zucchini. When you aren't supplementing your hamster's commercial food mix with fresh fruit or raw vegetables, offer a fresh source of protein. Good options include raw, unsalted seeds and nuts, excluding almonds. When you're providing seeds, go with sesame, sunflower or flax seeds. The occasional legume, such as a raw and unsalted peanut, lentils or edamame work, too. Your hamster will also appreciate the rare piece of mild cheese or tiny dollop of low-fat cottage cheese or plain yogurt. Hamsters can also get high-quality protein from some insects, including small grasshoppers, crickets and mealworms. Every once in a while, offer a little bit of boiled or scrambled egg and plain baked chicken or turkey. Certain foods can make your hamster ill, break her teeth or otherwise harm her. Remember not to provide fruit with hard seeds or pits still inside, and that almonds are no good. Never off chocolate, candy, potato chips or other human junk food. Avoid all canned and processed foods, including breakfast cereals. Other foods to forgo include potato, kidney beans, eggplant, citrus fruits, avocado, rhubarb, garlic, onions, leeks, chives, scallions and pickles. Never feed your hamster any pork product, either. This list is not all-inclusive; if you have any doubt or questions about the safety of a particular food, check with your vet or a reputable hamster guide.